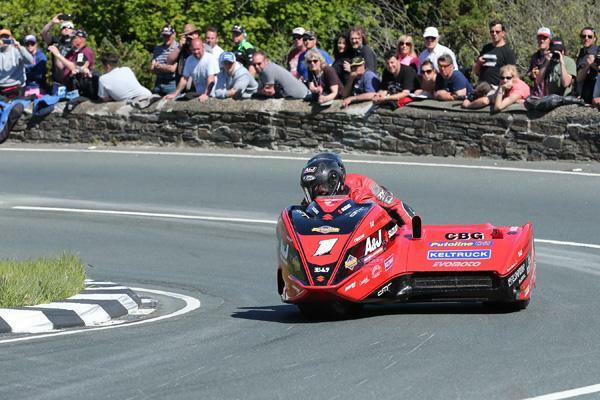 Ben and Tom Birchall took their second win of the 2015 Isle of Man TT Races, fuelled by Monster Energy, when they took a record breaking victory in Wednesday afternoon's Sure Sidecar race 2. Winning in a new race record time, they defeated Dave Molyneux/Ben Binns by seven seconds with John Holden/Dan Sayle coming home in third. Molyneux and Binns had the consolation of claiming a new lap record with a final lap speed of 116.785. The Birchalls grabbed the lead from the outset, leading Holden/Sayle by two seconds at Glen Helen with Molyneux/Binns a further two seconds back. Tim Reeves/Patrick Farrance were only 1.5s behind in fourth as Conrad Harrison/Mike Aylott and Ian and Carl Bell completed the top six. With glorious conditions all round the Mountain Course, the Birchalls lead was up to 2.5s at Ramsey with the top three still the same but Reeves/Farrance were reported as having retired at Glen Auldyn on the approach to the northern town. An opening lap of 115.549mph gave the Birchalls a 3.4s lead of Molyneux/Binns with Holden/Sayle still in third. Reeves' retirement promoted Harrison/Aylott up to fourth with the Bells now fifth and Gary Bryan/Jamie Winn. However, the latter pulled in to the pits to retire with Winn having lost his visor over the Mountain. It was clear the race was going to be a record-breaking one with all three leading crews setting 116mph laps second time around, the Birchalls only two seconds outside Crowe's 2007 lap record. Their lead now stood at 7.6s with Holden only 3.7s adrift in third. Harrison and Bell remained in fourth and fifth as Matt Dix/Shaun parker moved up to sixth. 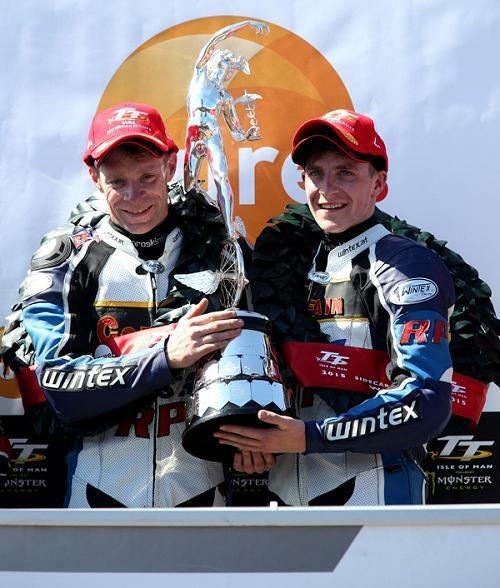 The Birchalls and Molyneux practically matched each other the whole way round the lap, the gap between the two hovering around the seven second mark and as they came along Glencrutchery Road for the final time, it was the Birchalls who got it, their third TT win in total, by seven seconds also breaking their two day old race record. They broke Crowe's lap record with a speed of 116.783 but Molyneux was a fraction quicker at 116.785 and reclaimed the record he'd last held in 2006. Holden/Sayle came home in third for their second podium of the week. Harrison/Aylott and the Bells had relatively lonely drives into fourth and fifth respectively as Dix/Parker secured their best ever TT position in sixth also posting their best ever 110mph lap. Wayne Lockey/Mark Sayers, Steve Ramsden/Matty Ramsden, Rob Handcock/Aki Alto and Tony Baker/Fiona Baker-Milligan completed the top ten. The Birchal brothers celebrate their win.